Especially with Halloween and the Holidays right around the corner! 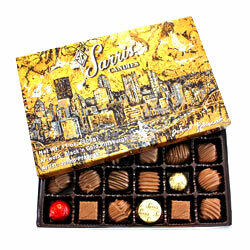 You can use a special group code of 77-7777 on Sarris Candies’ website, (www.Sarriscandiesfundraising.com) to purchase any of Sarris’ expansive candy fundraising catalog products, like the Pittsburgh Black and Gold Assortment (photo above). Sarris will then donate 25% of the purchase price to Ben’s foundation.